Tania Cox works as a chauffeur and lost-toy detective for her young family by day, and doubles as a writer by night. She has written several popular picture books, some of which have been published internationally. Her stories are perfect to read aloud to a very young audience and often feature alliteration, repetition and engaging story-lines that encourage young children to join in. Lorette Broekstra writes and illustrates picture books. She lived in the Netherlands for eight years, where she worked as a freelance illustrator, before returning to Australia in 1996. As a mother of two young children, Emma and Ruben, she developed an interest in children's literature, and in 1998 was inspired by her daughter's teddy bear to create her first children's book. Lorette has since written and illustrated many popular picture books. 'This is a vibrant happy book that celebrates mothers and children. ‘What makes your mum happy? The illustrations by Loretta Broekstra are most appealing with pictures capturing that special confidence of childhood. Full of colour, her beautiful clear drawings have all the little added features that will make this book a favourite with small children. Many different children and mums are shown in the pages and their clothes and shoes are full of interesting patterns and eye catching appeal. Even the cat has an interesting coat. Just in time for Mother’s Day this book would be a great discussion starter when talking with small children about their mothers and the things they like to do and how we can make them happy. It would also be useful when talking about feelings and how we can make other people feel happy / sad. 'December is, of course, for Christmas; February is for Valentine’s Day; April is Anzac….but May! …May is for Mother’s Day. It is a wonderful excuse to celebrate that very special woman in our lives. Those of us who are a little older buy presents, send cards. The smaller people draw pictures, pick flowers and give hugs. Remembering Mother’s Day is an important part of the school calendar and What Makes My Mum Happy is a perfect way to begin. Tania Cox’s charming text is a song about pleasing mothers and appreciating them. With simple rhymes and joyful refrains, it conveys the warm bond between young children and their mums. Lorette Broekstra’s illustrations perfectly compliment the text. They are a collage of patterns, textures and colours and can provide the launching pad of all kinds of creative Mother’s Day ideas, from cards to crowns, from bags to bouquets. 'What a wonderful book approaching mothers day!I love the child friendly language and pictures. Many things done in this book don’t really make your mum happy. However, mothers are very patent, loving beings. I know that my mum loves me no matter what I do in life or what mistakes I made. What a great example to show young children that their close family no matter of the things loves them they do. As mothers day approaches I will read this book to my 1/2 classroom and discuss why mums are so wonderful and what makes their mothers special people. Ask the children what does make their mum happy? What things do you and your brothers and sisters do for mum on mother’s day? 'This beautiful picture book highlights the simple little things that children do to show their mother’s how much they love them, and vice versa. Written in beautiful, lyrical and repetitive prose, Tania Cox’s story delights young children and emphasizes the special bond between a mother and child. Lorette Broekstra’s bright and beautiful illustrations captivate the reader’s attention and draw them into the story. For teachers it provides a fantastic springboard into celebrating Mother’s Day with students from Prep to Grade 2. As students follow the story there are plenty of opportunities for discussion as they notice the different families and activities. Young students easily relate to the little displays of affection, from blowing bubbles to baking mud-pies. • Make a list of the things your students do to show their mums’ how much they love them. Record these in a special ‘Mother’s Day’ book that students take home to share with their mums on Mother’s Day. • Have students create an illustration/artwork of one way they display their love for their mothers. • Make a ‘recipe’ book for how to make mums’ happy. 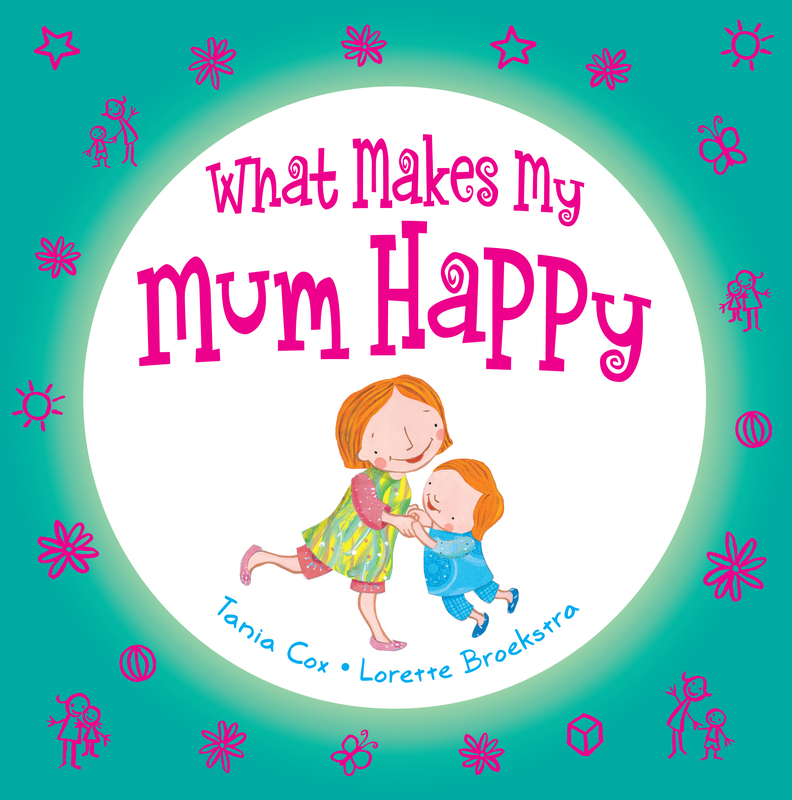 A delightful picture book that asks the question, “Do you know what makes my mum happy?” Readers are then introduced to 12 mums and the children who make them happy in a variety of special ways. The cover of the book has a colour combination of a teal background, glittery pink title and embossing and rose pink endpapers with white motifs of child like drawings. The cover shows a child hugging their mum and the illustrator has ingeniously drawn the child to represent either gender so that the book will attract both boys and girls. The text is simple and follows a rhyming and repetitive structure, so that children can read along too. The highlight of the book however is the style of illustration, which is playful, childlike and colourful. The illustrations look like they have been painted and feature realistic patterns that fill in some areas of the illustration. For instance, a real towel is shown draping on the bath tub that the twins blow their bubbles in. The hardback book is smaller than the typical picture book which is ideal for small hands and as it says on the back cover is “the perfect gift for mothers and children to share together”. 'Tania Cox has created a stunning picture book with relevance for children of all ages. 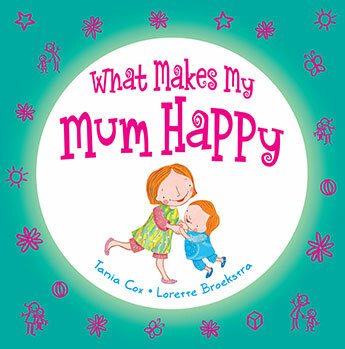 “What makes my Mum happy” looks at the relationship between children and their mums, from the point of view of a number of children as they detail the many ways that they are able to make their mum’s happy and in turn express their love and affection through actions. The rhyming text and engaging illustrations make it easy for children to relate to the various characters as they each describe some of the things that make their mum happy. What child hasn’t made their mum a mud pie, a paper crown or performed a song and dance for her? Children are able to feel a sense of connectedness with the characters through shared experiences and understanding. Both the text and the illustrations can be used in various ways, within a classroom, to spark discussions on topics such as diversity, families, feelings and emotions. The rhyme and rhythm of the text encourages the children to use creative thinking in trying to predict words which fit the sentence while at the same time maintaining the integrity of the rhyme. 'Having read What Makes My Mum Happy I feel this would be an ideal book to read to younger students in the lead up to Mothers Day or any other time we are reflecting on Mothers & their significance in the children's lives. It is a great little book filled with rhyme, bright vibrant pictures & repetition that any child would love. I feel it would definitely encourage a class discussion on what makes their own Mum happy & may also lead to some ideas on class activities such as making a crown for their mum or even writing having the children write their own story about what makes their mum happy. I also obtained a review of a Year 2 student on his thoughts of reading What Makes My Mum Happy. I read What Makes My Mum Happy to my mum, little brother and baby sister. I liked the book because it rhymed. My brother and my baby sister liked the colourful pictures. It was an easy book for me to read. This would be a good book to read at school just before Mothers Day or any day to give the class some ideas on how to make their mum happy.